This coming Sunday the Twisted Pepper closes its doors and calls time on what was one of Ireland’s most iconic music venues. Most of you will also know that it was once home to 3fe and indeed was the place where we first opened our doors in December of 2009. We closed up and made way for Vice Coffee in February of 2013, in an effort to create some head space for our upcoming roasting venture. I look back fondly on those days and will be forever grateful to Trev, Eoin, Ian, Conor and the rest of the crew at Bodytonic for giving us a space to set up shop. The Twisted Pepper was, at best, a divisive venue but to many DJ’s, Booksellers, Baristas, Hairdressers, Roller Derbiests and Tango Dancers (amongst others) it was a space to let loose and take a risk on some crazy ideas, some of which managed to work out in the end. It was our Boot Room, our Cavern Club, our Factory and our Woodstock all rolled into one. Over the years we had many ups, a few downs and met as eclectic a bunch of people as you could possibly hope to meet, many of whom I call friends now. As the news broke about its closure the other day, I got to thinking of my favourite 3fe moments at the Twisted Pepper and so I thought I’d share some of them here with you, for old times sake. Part of me is sad its gone but the rest of me is glad its over so we can all sit back and enjoy the nostalgia. I’m not sure there’ll ever be another Twisted Pepper, but I’m definitely glad I was a part of it while it was here. We opened our doors on Saturday December 5th 2009, although really it was just me, my friend Dave there for moral support, and a tray of brownies his wife Marie made. That same day was also the very first Beatyard Festival, although 100 people swapping records wasn’t much of a festival in my book. We made about €350 that day and I thought it was a solid enough start. The following Monday there was no festival and I think I sold about 10 cups of coffee, mostly to family and friends as the reality of the task ahead slowly dawned on me. A few weeks back, 3fe joined the Beatyard in Dun Laoghaire and welcomed over 5,000 people to the pier for music, booze, dancing and food. We’ve come a long way, baby. Eager to replicate a growing trend I’d seen in the States I decided to put on a brewing class at 3fe on a Saturday before opening, in order to earn some extra cash. Unfortunately only 2 people turned up but I decided to just go ahead with it and make the best of an awkward situation. Later a third person turned up a full two hours late but luckily I had no customers, so I did it again for them. Two of those people were Cian and Acky of Design Goat fame, who later went on to design our shop on Grand Canal street as well as many other beautiful spaces in the city. The other guy was a polish film maker whom I’ve never heard from again. 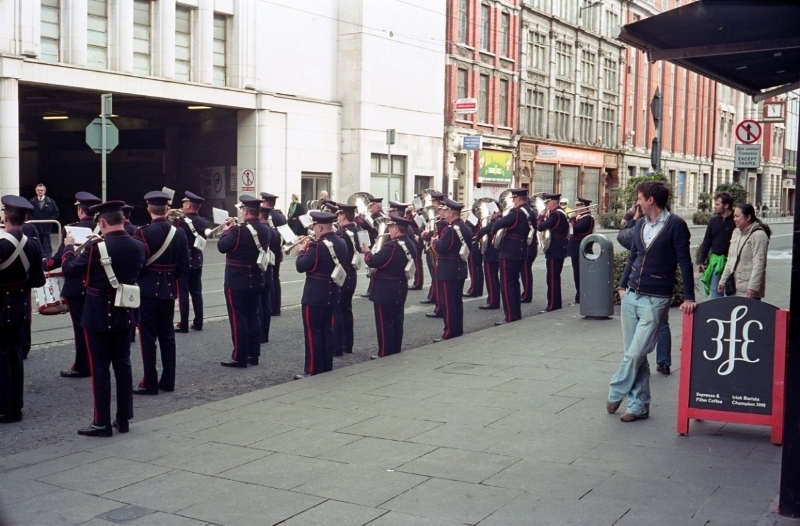 It was St. Patrick’s Day 2010 and the bands were practicing on Middle Abbey Street before the parade. David Walsh took this photo and I’m very glad he did. In 2010 I convinced the SCAE and Bodytonic to host the Irish Barista Championships at the Twisted Pepper. The venue worked a treat and although it was a little tight on stage, there was an awesome atmosphere and we even managed to convince the likes of Steve Leighton, John Gordon and Gwilym Davies to come over for the show. The infamous Paul Stack also came up with the idea (HT Rasmus Helgebostad) to run a coffee brewing competition when no such thing has been heard of before and the “brew ha ha” was born. This later gave rise to the brewers cup for which Ireland will always claim credit, despite what Nick Cho tells you. There were some particularly rowdy nights at the Twisted Pepper, most of which required a bit of a scrubbing afterwards. Chief amongst these was the brainchild of Dave Byrne, a student night that went by the name “Mr. Jones”. It ran on a Thursday night and every Friday morning the place would be in what can only be described as an “absolute jock”. We had at the time the world’s only shop-based Uber Boiler, and the staff of the TP lovingly referred to it as that €3,000 kettle. I built a special wooden box to cover it and frequently warned the bar staff to keep it safe and covered at all times. After a number of low key videocasts from various coffee locations, myself and Steve Leighton decided to ramp up Tamper Tantrum to eleven and host the first ever live event at the Twisted Pepper. The lineup was one of the most impressive ever with Cosimo Libardo, Lauro Fioretti, James Hoffmann, David Walsh, Gwilym Davies and Paul Stack alongside myself and Steve having a bash ourselves. We sold out the 100 tickets in a matter of days and people came from as far away as Germany, France, Russia and even Australia (though that guy was on a European holiday at the time). Tamper Tantrum has grown into a bit of a monster since then, clocking up over 50,000 interactions a month on its podcast and hosting other events in places like Shaghai, Nice, Manchester, Taipei and Vienna, amongst others. No matter where it goes from here it will still be hard to beat the atmosphere and buzz there was at that very first show. This was more of an ongoing thing than a one-off occurrence and managed to keep me amused while I ran a one-man fold away coffee shop with no customers in the lobby of a nightclub. Basically the scenario ran out like this: random guy/girl turns up at the Twisted Pepper the night after losing their coat/bag/scarf at the Twisted Pepper. They pull open the big heavy lobby door to find a fully fledged coffee shop in front of them. They look really confused, close the door and retreat 12 steps or so to see what it says above the door. They re-enter and tentatively ask “is this the Twisted Pepper?”. I’d go look for their coat while they seriously consider how drunk they must have been to have missed the coffee shop the night before. He’s not the most well-known of his like in the city but people that know Trev, know Trev. I’m sort of convinced that he runs the city. I first met Trev when a friend (Thanks Al) brought him by my apartment to try some coffee and snigger at the lunatic with the commercial espresso machine in his spare room. Only Trev would have suggested I set up shop at his premises, rent-free until it started to grow, and I’m eternally grateful that he did. If he wasn’t being supportive he was giving me a much-needed toe in the hole and although the Trev experience is not for everyone, there’s a lot of successful people in Dublin right now that owe Trev a debt of gratitude. A regular customer arrived in one day and ordered a flat white. He and Ger had a mutual love for each other which manifested itself into unbridled abuse on a daily basis. Ger put the coffee down and said "€3 please". The customer pulled some loose coins out of his pocket, looked closely and said "I only have €2.90?" Ger drank a mouthful out of his coffee: "€2.90 please". Once upon a time in a previous life, there was a full bar upstairs in the Twisted Pepper, in what later became the loft. When the lads decided to investigate the possibility of opening it up again, a guy arrived from one of the drinks companies to run “blue liquid” through the lines to clean them. Little did we know that the lines running through the floorboards had long since been pierced many times over by various trades folk. I first noticed one blue drop on the counter, then another. Within seconds customers were desperately running for cover as this mystery blue liquid dropped from every crack, hole and light fitting in the ceiling, leaving us with a destroyed cafe and a humungous dry cleaning bill. There were better days. One day I had a small group of people sit at the bar and quite excitedly order the “best coffee you have”. I asked them how long they had and they told me they had a few hours to kill. In order to amuse both them and myself, I decided to feed them small samples of various different coffees and quiz them about what they tasted, purely for shits and giggles. This game worked out pretty well and we had a bit of fun. After about an hour one of the group exclaimed that they were off to Oslo next and there was no good coffee there. I quickly corrected her and told her about Tim Wendelboe. London? Flat White. Copenhagen? Coffee Collective. Them: We play with a band. Me: Oh yeah, whats the band? Me: Wow, I’m such a huge fan, do you know them?? ?